With adjustable 1/4 and 3/8 inch screw on the top, can be linked with various cameras, DSLR, DV, smartphone holder and so on. With 3/8 screw hole on the base, can be used with tripod base, ball heads and so on, more practical. 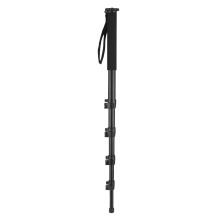 Portable photography monopod, made of aluminum alloy material, durable and sturdy. Max. tube diameter is 32mm, Max load capacity is about 10kg / 22Lbs, most photographic equipment can be used with. 5-section tube design, range of adjustable height 54.2-183cm / 21.3-72inch, can meet your different shooting needs. Only the monopod is included.